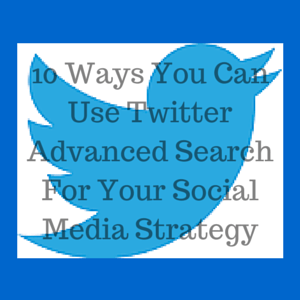 When I first came across Twitter Advanced Search, I was absolutely blown away. The advanced search makes it easy to find targeted individuals to interact with and/or market your products to. I learned about Twitter Advanced Search a few months after it was made available to the public, and ever since I learned about it, I used it often in my Twitter strategy. The advanced search allows you to filter out specific tweets and accounts based on what you type within the advanced search, but it can look confusing to a beginner. In this article, I will dispel the confusion and share with you 10 different ways you can use Twitter Advanced Search for your strategy. The Twitter Advanced Search allows you to search for tweets containing specific keywords. You have the choice to decide whether a tweet must include multiple keywords (in the advanced search, that option is “All of these words”) or if a tweet contains one of the keywords that you specify (in the advanced search, that option is “Any of these words”). Since I am a digital marketing expert, I will occasionally search for tweets about digital marketing to strengthen my knowledge. When I search for these tweets, I use Twitter Advanced Search to find all tweets with one or more of the following keywords: Social media, digital marketing, and blogging. Retail stores can search for keywords based on what they sell and then interact with people who sent relevant tweets. With hundreds of millions of tweets getting sent every day, it won’t be difficult to find a series of tweets with the keyword(s) you are looking for. One of the concepts few people recognize is how many timezones and languages fill up our planet. When you are used to hearing the same language in your neighborhood, your community, and in your every day life, it can be difficult to acknowledge that people talk and speak in other languages. On social media, it is easier to understand this concept, but there is an important connection between someone’s language and our brands. Want to know why language matters for our brands? Here is an example. I am a blogger who writes blog posts in English. If you are with me at this point, then you are most likely read and speak English like it is second nature. However, there are some people who don’t understand English. If you don’t search for the specific language that you use to communicate with your audience, then you risk coming across someone who speaks in a different language and won’t understand yours. If one of my visitors has neither spoken nor read English in his/her lifetime, then I know it is practically impossible for a relationship to build. How can a visitor appreciate my content if that visitor does not understand the language I am using? Searching for a specific language prevents you from running into this problem. If you are an international brand with locations in different countries, then this won’t apply to you, but for most of us, the language a person understands impacts whether that person could possibly appreciate what we do or not. Twitter Advanced Search allows you to see a bunch of tweets that mention other people. I use this feature to find people who interact with other social media thought leaders. Why is this important? Well, think of why a Twitter user would meaningfully engage with a social media thought leader’s tweet. Twitter Advanced Search follows up with tweets from people who all share a passion for social media and engage with other tweets about social media. These people are, by definition, people who interact with other social media thought leaders. As a digital marketing expert, I want these types of followers. If these people see my tweets, then they will engage with my tweets all the same because I am passionate about digital marketing and send numerous tweets about my niche. Brands can use this feature to see what other users say about their competitors. If certain users express frustration that your brand could fix, you can offer your services as a solution. Successful products and companies solve other people’s problems. You can build a successful brand solely around solving other people’s problems that the other brands couldn’t or wouldn’t solve. The feature of getting a list of tweets from a specific group of people allows you to create a temporary Twitter list filled with your favorite (or least favorite) tweeters. When I am in the mood for a good laugh, I will use Twitter Advanced Search to search for the tweets posted by humorous accounts. I use this feature more often to learn more about digital marketing. I will type social media thought leaders’ usernames and then see a variety of tweets all about digital marketing, social media, and other tweets along those lines. If you find yourself using Twitter Advanced Search solely for this feature, it would be more advisable to create Twitter lists instead. Since my business is on the web, I don’t always use this feature. Retail stores and restaurants would benefit more from this feature because they could locate Twitter users close enough to stop by (and hopefully make a purchase). The advanced search also accounts for keywords, so if a restaurant was using Twitter Advanced Search to find ideal customers, that restaurant would search for a nearby location and then keywords like “food, hamburger (if the restaurant offers hamburgers), restaurant (maybe competing restaurants will show up. Your restaurant can say, “Come give us a try” but in a meaningful, non-sales-y way). For bloggers and web based businesses, you can search for people by location when you host an event or envision yourself hosting an event in a particular part of the world in the future. Twitter Advanced Search shows an array of tweets written from the first days of Twitter to today. You should only opt to see the most recent tweets. If you own a restaurant and are looking for more customers, and you see a tweet written a few years ago in which a nearby individual wanted to know of a good restaurant, then that person’s past needs may no longer be relevant. So many things can happen in a few years. Maybe the person found a restaurant. Maybe the person lived somewhere else during that tweet and moved nearby after the tweet. Maybe that person is already a customer (you don’t want to tweet to a loyal customer asking them to give your restaurant a try). I always search for tweets within one week, but depending on your brand, you may find it better to search for tweets posted in the past three months. Try it out and see what works for you. When I look for people to follow on Twitter, I look for people who actively engage with other social media thought leaders. However, not all of these tweets are positive, and I don’t want to follow someone who I know is very likely to not appreciate what I do. When I do these searches, I make sure these are positive tweets. Some people like to express how much they enjoyed an article, and those are the only types of tweets I see when I check in the Positive option in Twitter Advanced Search. If people positively react to the leaders within your niche, and you provide value in your niche, then these people will positively react to your tweets, but only if these people see your tweets. I get these people to see my tweets by following them, and many of these people are highly likely to follow back based on their follow ratios and because I tweet digital marketing advice. You can search for negative tweets about your competitors and look for common patterns. These common patterns will detect where your competitors fall short, and your brand can become the solution that leads to you helping others while making a profit. Successful brands try their best to help others, but some customers fall through the cracks. Searching for negative tweets allows you to find the customers who have fallen through the cracks. With this knowledge, you can fill up those cracks so more customers can find the advice or product they are looking for. Some people will have a question about your niche, but not everyone who has a question gets an answer (FYI: if you want your question answered, the first step is to ask the question in the first place). Some people will ask their questions on Twitter, but not all of those questions will get answered. You can be the person who answers other people’s questions about your products and similar products within your niche. Some people may ask about your customer service or someone else’s customer service. When you provide your meaningful answer, the person who asked the question will be grateful for your reply, and that’s one of the ways to build a relationship between you and a potential customer. When you search for retweets, you will get an idea of what is popular within a certain niche. If you look for patterns, you will discover what patterns you can use to make your tweets more desirable so more of your followers retweet them. If you only tweet desirable tweets, then people will come back to your profile often to read your tweets. When someone reaches this stage of the relationship building process, it will be difficult for that person to forget about you. Twitter Advanced Search is one of the most sophisticated search engines on the entire web. It effectively filters the billions of tweets on the web and allows you to find the exact tweets you are looking for based on keywords, people who get mentioned, people sending the tweets, language, emotion, and other essential filtering methods. Do you use Twitter Advanced Search? Has it become a vital part of your business? If you did not use Twitter Advanced Search before reading this blog post, do you plan on using it now? Please share your thoughts and advice below.